Follow our new WorkHappy Manifesto to set yourself on the path to career satisfaction. We are all about working happy at The UpWrite Group. But this was not always the dominant thinking in our culture. Work was about making a living. You didn’t need to be happy. You didn’t need to like the people you worked with — especially the boss. You didn’t need to feel like you were contributing to something bigger, or even need to share their values. It’s not personal, it’s business. And while there are still those out there who follow this line of thinking, we are here to say that this is a bunch of boloney. Yes, you still have to earn a living and support your own existence. But what you don’t have to do is earn a living and support your own existence on someone else’s terms. All you need to do is look at the numbers to see how entirely personal working happy is. For example, if a person begins work at age 25 and retires at 65, they will have worked for 40 years. Given 365 days in a year, and excluding weekends and ten national holidays, this leaves approximately 250 8-hour working days per year the average person will log — resulting in 2,000 working hours per year. Over 40 years, this equals to 80,000 hours of work. Now, we all know that this “average person” is a bit of a unicorn. While a lucky few work less, many work so many more. Most people in our network began working full-time before age 25 unless they attended grad school (and let’s face it, grad school is work — and work that often requires an additional part-time gig, at the very least). Getting off at five has become an urban workplace myth, and if you follow the news at all, you’ve noticed pushing retirement back is trending — which has produced an older workforce. All of this is to say that 80,000 hours is an incredibly conservative number, and way too many to spend at a job that doesn’t challenge you, offer opportunities for professional growth and advancement, and make you smile (most days). This is not your practice life. I repeat: This is not your practice life. You have one life, and you should focus on filling it with people and issues that are most important to you. It’s time to make the most of it. It’s time to challenge yourself to choose happiness. The UpWrite Group chooses happiness through practicing seven principles in four key areas. #1 I work happy because I deserve to. #2 My career does not define me; I define my career. 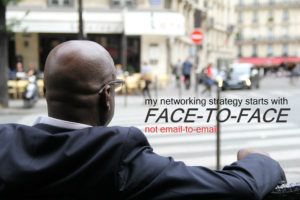 #3 My networking strategy starts with face-to-face, not email-to-email. #4 My goals are aggressive and my work ethic is relentless. #5 I surround myself with positive people who have pure motives. #6 I go out of my way to mentor, coach, motivate, grow, advance, mobilize, challenge and inspire others. #7 I turn down opportunities from companies misaligned with my moral compass. We’ve all heard this one. It is all about happiness; if you love what you’re doing, then it won’t feel like work. And isn’t this the goal? To not wake up and immediately dread the day ahead? To not slog through the day, and silently urge the minutes to pass until the clock strikes 5 p.m. (or whenever that magical time is for you to punch out)? This brings us to principle #1: I work happy because I deserve to. Work happy not just because it is what you want, but because it is what you deserve. Don’t let fear be an obstacle in your path to work happiness. Whether you desire to change companies, change industries, get promoted, or embark on your own entrepreneurial success, challenge yourself to take solid steps toward a career you enjoy. Do what you love and don’t be afraid to fail, because you might. In fact, you probably will. Allow yourself to take something away from your failures, such as developing well-respected character traits like drive, resiliency and grit — capstone traits you can take with you wherever you go. It was H.P. Lovecraft who once said, “The oldest and strongest emotion of mankind is fear, and the oldest and strongest kind of fear is fear of the unknown.” This is especially true when it comes to our careers. We are anxious about transitions even when we know it is time to make a move. This is because change is uncomfortable. While it’s scary, it can be exciting to go down a road no one in your immediate network has tried. The fear of time is the fear of what the future holds, but it is also about time that has passed —skills you think you should have learned; internships you wish you had taken. We hear all the time about the “overnight successes,” but what is often overlooked are the time and risks taken, the failures experienced, and the hard work put into that success. Appreciate your current position, or transition, for what it is. So what if you didn’t develop certain skills previously? Do it now. Or, approach your new position or job search in a different way than your predecessor. Make the job your own. Follow your dreams slowly and with intention. There is nothing written in a rulebook that says to follow your dreams, you must leap into the abyss and abandon the all the comforts of the familiar. Keep your focus in the present: What can you do right now? Recognize potential issues that may come later, but don’t waste effort worrying about something that hasn’t happened yet. Look at a career change as a time to meet new people, develop new skills, and widen your social footprint. All of this directly relates to finding happiness in your current position. It is easy to say, “follow your dreams,” but not everyone does. This is because it is much harder in practice. That whole supporting-your-own-existence thing means many people work in jobs they dislike to get the bills paid. Loving what you already do sometimes is about learning how to take the long view of things. Repeat after me: My career does not define me; I define my career. Take charge of your own professional and personal development. No one is as invested in your future or interested in your success than you are. Take concrete actions in securing your professional success. Working happy is also about prioritizing people over processes: My networking strategy starts with face-to-face, not email-to-email. Build strong working relationships by attending networking events and setting up regular check-ins to nurture both new and established relationships. Securing a mentor is a great way to learn new skills and expand your professional network. But they can also help you avoid becoming overwhelmed. At times, we are too close to our own situation to realize that we are doing great, or that a simple change in our approach could greatly improve our happiness or success. Build relationships that are authentic and not just based in “exchange value.” Be genuinely interested in using your talents and resources to help build the success of others. Nevertheless, loving what you already do does not mean you don’t want more, or won’t eventually outgrow your position. You can take happiness from what you currently do and still desire something more or different: My goals are aggressive and my work ethic is relentless. Your professional five-year plan may mean you aren’t in your current position, even if you currently enjoy it — and that’s OK. But take your happiness with you when you go. Approach interviews for new and interesting positions as a two-way street. Ask how the potential employer helps its employees grow professionally, and be sure you understand how the company measures success. And if you can secure a job with a company whose work culture aligns with your own needs — all the better! The American workforce is experiencing a dramatic shift in the way work is performed. We are seeing less 9-to-5ers and more of industries requiring work-on-demand projects that has changed how — and when — we perform work. This, along with the ever-increasing amount of hours Americans work — means the division between home and work is blurring, which changes the concept of work/life balance. Instead of trying to focus on balancing our work with our lives, we need to engage in a more sustainable happiness. Focus on the quality of your work. Your career does not define you as a person. Working a crazy number of hours isn’t a necessary task to prove yourself. And the opposite isn’t true either. When you build yourself up through your career, your career can play as much of a role in your image as you want it to. It can be a huge part of how you see yourself, or it cannot play a part at all — just be happy with the result. In 2004, an unassuming little one-act musical that chronicles its own creation as an entry in the Musical Theatre Festival in New York City debuted. The musical, “Title of Show,” later went on to play in multiple theatres, and landed on Broadway in 2008 for 13 previews and 102 regular performances. It offers multiple arrangements, but the one that resonates deeply is one titled, Die Vampire Die. The song regales issues surrounding overcoming criticism and defeating doubts. Within the context of the show, it speaks directly to creative work. However, the types of vampires — “any person or thought or feeling that stands between you and your creative self expression” — the song recounts are relatable across most industries. Pygmy vampires exist in the small, everyday doubts that are reinforced by our broader culture. There is always a lot of pressure to agree with them, and they can be overwhelming. Vampires of Despair are our evil inner thoughts. If you are not familiar with the song, PLEASE TAKE A LISTEN. Then, do your best to slay the vampires: I surround myself with positive people who have pure motives. Cultivating a supportive network for yourself helps to create barriers against these types of vampires, and is essential to feeling happy in our work. While you can always try your best, know at the end of the day you cannot change other people. Limit your interaction with negative people as much as possible. You will receive criticism throughout your career. If it is constructive, then it will push you to grow and learn something about yourself. If it is not, it holds no value. Don’t become a vampire: I go out of my way to mentor, coach, motivate, grow, advance, mobilize, challenge and inspire others. Remember your own vampires and use your past fears to motivate and mobilize others once you get established. Be the mentor to the new associate who might feel alone, or to another employee in whom you recognize the drive and ability to do something more than their current position allows, and help them take the leap into something new. There are a lot of aspects of work culture that we attribute to workplace happiness, like benefits including generous 401(k)s, vacation packages and parental leave; flexible work schedules that may include telecommuting; and office culture that promotes collaboration and teamwork. But these things can only aid happiness; they cannot create happiness. Happiness is largely a choice. External factors hardly ever align perfectly to offer a “utopic” work environment; there are aspects of every job that will be more enjoyable than others — so focus on those. Find colleagues you respect and enjoy spending time with. Examine your skills and interests and identify a work task you can perform everyday that you get fulfillment out of. The choices you make define your experience: I turn down opportunities from companies misaligned with my moral compass. Remember all those hours calculated earlier on the amount of time we spend working? Don’t give them to someone else. This does not mean you need to be your own boss. But you should strive to work for companies that hold similar values and aim to achieve the types of goals you want to achieve. Collaboration can create a stunning impact. Working for a large company does not automatically make you just another cog in the wheel, if you believe in the work you produce and the initiatives set by the company. Many companies offer every employee a voice — along with the resources they would not have had access to on their own to create meaningful work. Choosing to work happy means choosing to live your life as it happens. Much of our stress is cultivated through our responses — not from specific life events. An attitude adjustment can go a long way to finding joy in the every day. So choose happiness. Choose to grow. And choose wisely. But if you choose wrong, don’t be afraid to choose again. And we can help you get there. We spend our days helping individuals and organizations alike to produce content, craft a personal brand they’re proud of, and attain jobs they are excited about. If any of the above describes you — or who you want to be — come talk to us. We’re your kind of people.